Can you believe it is already Back to School season? I am going to admit this is one of my favorite seasons of the year. Why you ask? Well, it reminds me of my childhood and the fun we had shopping for clothes and school supplies. As an adult, it brings back memories of getting my classroom ready for all my high school students to come and learn. I love the feeling of back to school season. It really makes me happy. The best part of back to school time is shopping! I really do love stocking up on pencils, paper and markers. But every year I tend to forget something important from my list. Like last year, we forgot to get my daughter a pencil box! Yes, that is right. Probably the most essential school supply since it holds all the other supplies. Lucky for me I had one at home we dug out, cleaned up and called good for the year. But this year, I'm prepared!! 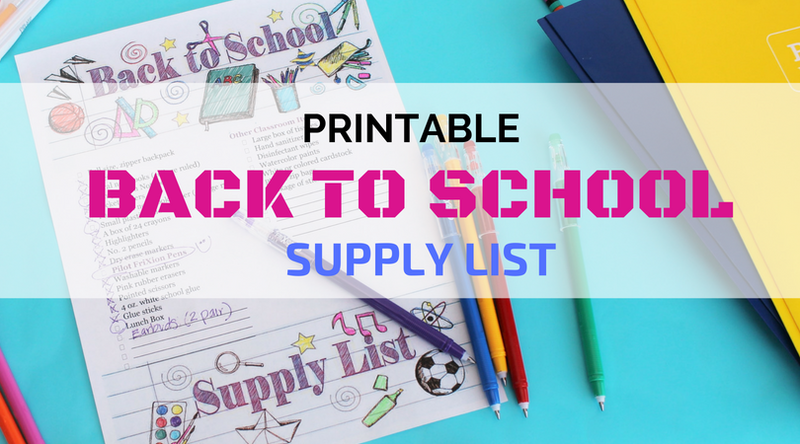 I've put together a super simple Printable Back to School Supply List. That's right. You can avoid my mistakes and print out the list for free!! Plus, I've made it way more interesting then just printing out a list. This printable is also a back to school adult coloring page. So while you are sitting there trying to figure out how many bottles of glue your kids need for school, you can color too!! We usually start at our local Walmart. The deals are good and we can get almost everything in one trip. This year we grabbed the glue, the scissors AND the pencil box. However, we also grabbed these Pilot Pen FriXion ColorStick Pen that are ERASABLE!! (Pretty sure they will be my newest best friend.) They were on the end cap of the back to school aisle. Couldn't resist. I decided they would be perfect for using with my Printable Back to School Supply List. I love making lists. Maybe that is weird. But I get so much satisfaction from writing down all the things I want to accomplish and than crossing them off as I get them done. (Please tell me I'm not alone.) Perhaps that is one of the reasons I love to shop. I can make a list, head to the store and cross off all my purchases as I find them. It is so satisfying. And our back to school adult coloring page is a great way to make a list and get to color at the same time. Let's show you how it is done. Print out our Free School Supply List. You can print it out in black and white or color. There is a little color on the text, but it isn't essential for the back to school supply list to print out. 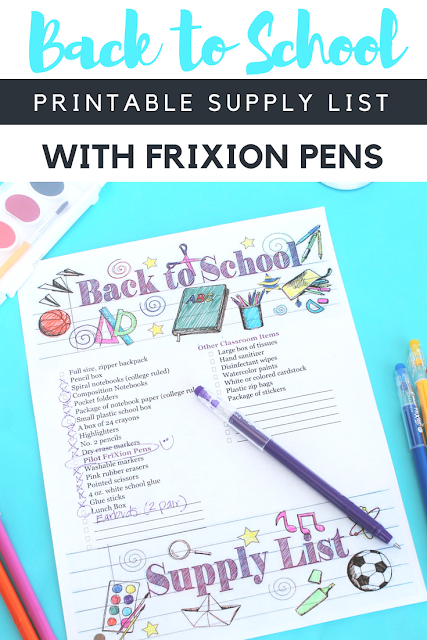 Go through your child's school supply list online and add any items not already listed using the FriXion ColorSticks. For instance, my kids both need earbuds this fall. That was a new item not listed, so I added it. Don't worry if you mess up because the FriXion pens are erasable!! You can write super smoothly AND erase cleanly every single time. 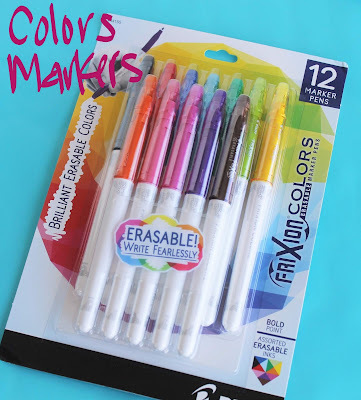 As your thinking of items to add to the list, color in the back to school images using the FriXion ColorSticks. With the 10 different colors available, these pens are great for coloring, journaling or checking off your to do list. Plus, these pen's write super smoothly because of the gel ink. I love a good gel ink pen. Now's your chance to go print our Printable Back to School Supply List Adult Coloring Page. Not only will you get organized fast, but you'll be able to relax and color a little too. 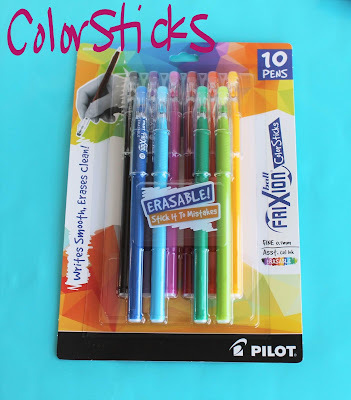 And don't forget to head over to Walmart.com and grab your own set of the Pilot Pen FriXion ColorSticks so the next time you happen to write something wrong, you can simply erase it away.